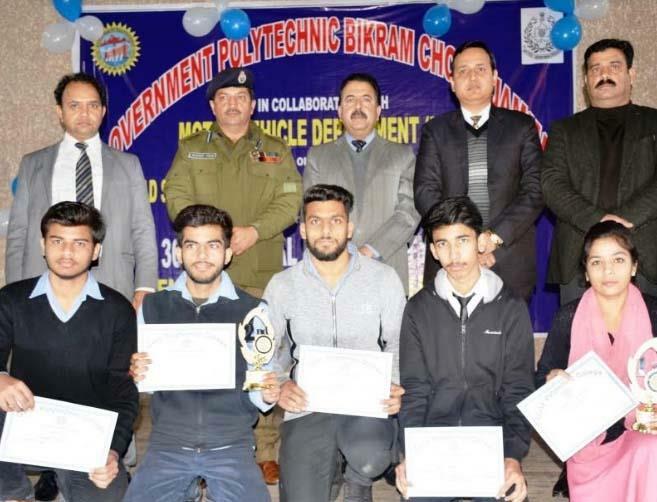 JAMMU, FEBRUARY 09: Government Polytechnic Jammu in collaboration with Motor Vehicle Department organized an awareness programme here on the occasion of 30th National Road Safety Week. Director Technical Education, J&K, Dr. Ravi Shankar Sharma was chief guest of the function. Deep Raj Kanathia, Regional Transport Officer Jammu, Joginder Singh, SSP Traffic, Jammu City, Er Arun Bangotra, Principal Government Polytechnic Jammu and Jugal Kishore Sharma, ARTO Jammu were also present on the occasion. Director Technical Education briefed the budding engineers about their responsibility towards road safety and urged them to strictly adhere to traffic rules and regulations. Er Bangotra advised the students to strictly follow the traffic rules and drive two-wheelers with crash helmets only. RTO threw light on the importance of safety rules needed to be followed while driving on the road and advised the gathering to avoid rash-driving, over speeding and avoid the use of mobile phones. SSP Traffic, Jammu City said that over speeding is the major cause of road accidents and called upon the young students to follow traffic rules and drive within prescribed speed limits. On the occasion, a debate competition was also organized by the College on the theme ‘Sadak Suraksha Jeevan Raksha’.